Apple’s latest invention is upon us. As with most releases of new technology in our day, there are reasons to shy away from it. Results show substantial changes in the blood from short-term cell phone radiation exposure in nine out of ten human subjects. RBC [Red blood cell--W. G.] aggregation and stickiness were mainly observed following 45 minutes of exposure to a smart phone in receiving mode worn by subjects in a backpack. By contrast, RBC morphological (shape) changes including the formation of echinocytes (spiky cells) were dominant after subjects actively used the phone for an additional 45 minutes. It appears that RBC stickiness with clumping is the first stage of the cell phone radiation effect. Subsequently, the RBC aggregates tend to break apart, and then cell shape changes occur, in which echinocytes and other misshapen cells are observed. Not all subjects showed both types of changes. The difference in net RBC aggregates between the carrying and the active use conditions are not significant for this small sample, as indicated by the overlap in the error bar values in Figure 15. However, the differences in RBC shape changes between the carrying and the active use conditions appear to be significant. In the scientifically regimented state, the citizen becomes little more than an amalgam of behavioral repertoires whose every thought, feeling, and idea is the product of external stimuli. From the scientistic vantage point, the populace's motivations can be calculated and systematized, thereby allowing those few conditioners who are accountable to no moral master to develop economic and technological stimuli that can produce the desired patterns of mass behavior. Such a societal model is known as a Technocracy, which Frank Fischer defines as follows: "Technocracy, in classical political terms, refers to a system of governance in which technically trained experts rule by virtue of their specialized knowledge and position in dominant political and economic institutions" (17). The stone is the soul’s illness by which all the other spiritual illnesses are guarded incurably and which the holy fathers call insensibility. Many will say, what sort of sin is this? We have never heard of it. According to the fathers, insensibility is the deadening of spiritual feelings, the unseen death of the human soul with respect to spiritual things in a life that is flourishing with respect to material things. From a long-term physical sickness all strength can become exhausted and the body’s abilities withered; then the illness cannot find any more food, and ceases to torment the body’s constitution. It leaves the sick man alone and wasted, as if dead and incapable of movement due to the debilitating suffering, the terrible, dumb morbidity that is not expressed by any particular suffering. The same thing happens to the human soul. Long-term slackness of life amidst continuous distractions, constant voluntary sins, forgetfulness of God and eternity, inattention or only superficial attention to the Gospel teachings removes from our spirit any inclination toward spiritual things, and deadens it to them. Although they continue to exist, they cease to exist for our spirit because its life has ended for them—all its strength is directed toward the material, the temporal, the vain, and the sinful. ‘ . . . In hell, the absence of life in God means also that normality is absent from the world, which is transformed into a mass of hallucinatory shadows cast up by the movements of chaos. . . . In the state of sin our very being can advance to such a condition of self-centeredness that it almost no longer knows whether creation really exists’ (pgs. 177-8). ‘We have seen, moreover, that the world has a meaning only because, being malleable, it can be led toward a mode of existence that is higher and eternal, toward the perfect truth or good that consists in love and union between God and the world, between humans and God, and among humans themselves, that is, only if the world is seen as a transparency that grows finer and finer to promote the relationship of total love between humans and God and among humans themselves’ (p. 172). There are many posing as wise leaders. Southerners like any people must discern the truth-tellers from the liars, following the good and running away from the evil. The choices are the same as they always have been: whether to follow those who love man and seek to overcome the evil ghosts; or those who love the evil spirits and seek to destroy men. In men like Glenn Beck and Pastor John Hagee, we have those who lean toward the latter, however good-intentioned they may be. John Hagee exploits a variety of Biblical prophecies to push for what amounts to a holy war against Muslim nations. When he writes his books and preaches his sermons, his aim is not spiritual or academic; he clearly desires war against Iran and increased American hostility toward Russia. He also completely distains political self-determination for the Palestinians; he opposes granting them an independent state, dismissing their identity as entirely manufactured. Waxing prophetic for his followers, he even suggested that last year’s Ebola outbreak was punishment on America for Obama allegedly trying to “divide” the land of Israel. Berdyaev’s analysis describes well the fruits of wedding Dispensationalist eschatology to Atlanticist geopolitics. Such grand distortions deprive the image of God to Russians, Iranians, or other villains de jour, casting them only as evil and depraved instruments of infernal powers. They are not only denied the divine image, but the freedom and human agency that corresponds to the spiritual personality. And while a few individuals among them might be “saved,” according to this formula, the collective peoples of Russia, Iran, and other Muslim nations are primarily destined to be hurled into hellfire after they serve their purpose on the cosmic stage. . . .
Of the former, we may look to St Matrona of Moscow (+1952). Ræther than play power politics, she shunned it, and taught others to do the same. On the days when political demonstrations were held, Matrona urged everyone not to go outside, but to close their windows and doors. Hordes of demons, she said, occupied the entire area, filling the air and troubling people. Perhaps, here, Blessed Matrona, who often spoke allegorically, wanted to remind those around her of the need to guard the ‘windows of the soul’ – as the Holy Fathers sometimes call the senses, from evil spirits. What can be said of those like Mr Glenn and Pastor John who bring forth those cries of the needy by stirring up wars and troubles in the world, with their death and grief and famine? Those who give life or those who slay it? Đose with bodily blindness (St Matrona was born blind) or those with ghostly blindness? 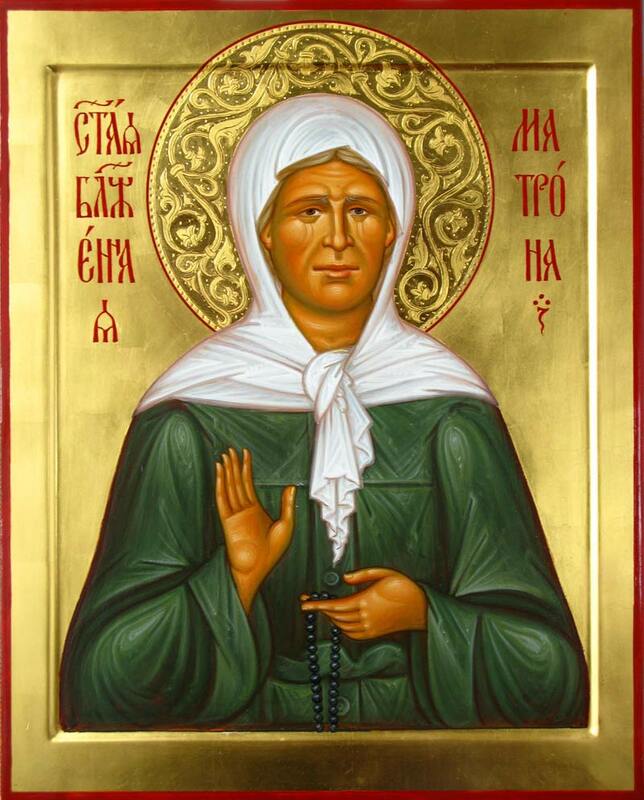 The Orthodox way of St Matrona and all the Church’s saints or the way of Western spiritual death? Such is your choice, Souðron. Holy Saint Matrona, pray for us sinners! Ukrainians of the east and southeast of that country (Novorossiya, New Russia) opposed to the American/E.U.-imposed Nazi regime in Kiev have adopted the symbols and songs of Ol’ Dixie in their stand against those invaders. As they have learned from us, we ought also, in our turn, to see ƿhat we can learn from them. Father Matthew Raphael Johnson posted again not long ago a recording (originally from 2009) about Ukraine’s resistance to the satanic New World Order that is worth a Souðron’s time. The themes of national solidarity through faith and struggle, of a true diversity of countries without an all-powerful Empire ruling over them, of an agrarian basis for society, and more besides, are very needful for the South and for all peoples to hear and heed today. Here are two poems from the Ukrainian writer and artist Taras Shevchenko that will give one a sense of the strong desire for freedom and of the love of their native land that holds among them (and that ought to be amongst other peoples as well). An angry wind howls aloft. Lifting waves as high as mountains. It jumps up and dives down. And the ash tree creaked now and then. With the enemy’s evil blood. With a kind and quiet word. In fact, the South is a living thing and it has thrived with dynamic change throughout its history without ceasing to be the South. It is a losing game for the South to try to be more “American” because America is moving so fast in the wrong direction that we could not keep up even if we wanted to. This is a tall order. We operate under very different circumstances than our forebears who moved in a land still under development. We have to move in a highly-developed context. Armed resistance is not an option. It would be futile and counter-productive. But we can learn from our forebears’ spirit. We must obey the conqueror most of the time but we don’t have to accept his claims of legitimacy. We can abjure the realm, secede in spirit and in every other legal way we can. I think the dedication and the talent exists out there to keep Dixie vitally alive while “America” is dissolving. What path ought Southrons and other traditionalists in the world tread wið respect to the totalitarian American Empire? Some good guidance may be gleaned from Father Andrew Phillips’s answers to questions below. The united States Constitution of 1787 is believed by many in the American Union to be based on Christian principles. John Adams’s quote, ‘Our constitution was made only for a moral and religious people. It is wholly inadequate to the government of any other’ (Wikiquote), is a favorite proof text of theirs. To the extent that the sinful tendencies of man are acknowledged in the provisions of this writ, it is a true saying. But insofar as one sin or a set of sins are pitted against other sins to bring about good for the commonwealth by federal officials, it is in sooth no Christian document. Þe Holy Apostle teaches us, ‘Be not overcome of evil, but overcome evil with good’ (Romans 12:21 KJV). But James Madison, the father of the Constitution, gainsays him in Federalist No. 51: Let ‘ambition . . . counteract ambition’ (Calhoon, Evangelicals and Conservatives, p. 85). That is, use evil to overcome evil. By thus bestirring a strong highmindedness within those in government, we see the real quickening force behind the u. S. Constitution and other charters like it: self-love. Yet Christians are taught over and over again to reject self-love. St Maximus the Confessor (+662) names it as the ‘mother of all vices’ (Thunberg, Man and the Cosmos, p. 95). Thunberg continues, new-wording St Maximus, ‘The life of vice is characterized by a continual disintegration . . . philautía [i.e., self-love--W.G.] generates a multitude of passions . . . and thus dividing the unity of human nature into thousands of fragments. . . . The vices cause these divisions . . . also between him and his neighbors, since all men participate in the same nature and are called to a unity guided by this principle and aim’ (p. 95). Simple disagreements among men are not the only fruits of these divisions. St Maximus teaches further, says Thunberg, that by embracing self-love, which necessarily involves a flight from God, man will raise a ‘tyranny against his neighbor’ (pgs. 56-8). Thus, the very thing the u. S. Constitution was written to guard against is its natural outcome because of its unchristian handling of man’s passions. Self-interest, which is another name for self-love, the guiding moral principle in Western governlore and geldlore since the days of feudalism, therefore, cannot be the foundation for a folk or their government. For self-interest and the vices springing from it yield only disintegration and destruction, not better union, peace, justice, and all the other goals of the u. S. Constitution’s Preamble or of any other virtuous people. This is one kind of constitution, the constitution founded on self-love, and it is not Christian. The second kind, the truly Christian constitution, is one founded on love. ‘It is impossible to build a life based on wickedness and hatred, for they are the principles of destruction,’ Archbishop Averky Taushev (+1976) says. ‘ . . . love is the only creative force in life; it is the source, the root, the well-spring of all creation. The only reason for the creation of the world and man by God the Creator is His love . . . . This love ennobles our entire life; it creates and inspires all that is truly great, truly beautiful. Family life, society, and government are grounded in this love. In short, love is the vivifying, fundamental life-giver of the world. This is fully logical, for love is from God, and God Himself is love’ (Struggle for Virtue, pgs. 32-3). ‘This mutual love [among Christians--W.G.] is a distinguishing characteristic of Christianity. Therefore, where there is no love, there is no Christianity’ (p. 32). This is quite an upbraiding in itself, but Archbishop Averky shows further the incompatibility between Western, Madisonian constitutions that kindle the fires of self-love in man (which he names ‘egoism’ below) and Christianity: ‘The teachings of Christ are all directed against egoism. The task of the Christian faith is to destroy all manifestations of egoism in a person, and thus to eradicate egoism itself, and in its stead to implant true spiritual Gospel love which excludes any egoism’ (pgs. 56-7). Therefore, instead of relying on an elaborate system of checks and balances as in Western constitutions of distrust to bring about justice for the people in a commonwealth and their various interests (i.e., allowing each to have what is due him), love is the guardian against injustice. St Maximus teaches, quoth Thunberg, ‘God is by nature good and detached, and He manifests these two attributes in loving all men alike.’ Man, when he is free from self-love and its attendant vices, also loves all oðer men alike, manifests perfect ‘balance and equilibrium’ in all his actions toward others (pgs. 99-100, quotes at 99). The proper bulwark for protecting against favoritism and other governmental abuses is thus an inward virtue, residing in man’s ghost, and not an outward arrangement of counterbalancing branches and levels of government. It is for such reasons that governments in Orthodox Christian countries are less sharply defined than those in the post-Schism, Protestant and Catholic West - often mirroring the family, with elders and a father-king in places of authority. For in the West outward, neatly arranged, overly rational systems have taken the place of the fulness of the inner life of the Kingdom of God bestowed by the Holy Ghost, which the Western nations lost when they sundered themselves from the Orthodox Church. This should not take anyone aback, for where the Holy Ghost dwelleth, there love and all the other virtues abound, and the law of man and his cleverness and his jinnies and pulleys and chains and levers to forhold man’s use of power are not needed (Rom. 14:17, II Cor. 3:17, Gal. 5:22-3). Þe South, as she often does, finds herself in tension between the errors of the schismatic West and þe truth of the Orthodox Church: on the one hand, very often overthoughtsome toward outward arrangements of government power (Calhoon, p. 192), that is, leaning toward mistrust, and on the other, always retaining and stressing the need for a familial tone and structure among her folk as a whole (pgs. 193-4), which implies the Christian virtues of love and trust. There are then two choices for the South. She may follow the unchristian, Western tradition and have a constitution of mistrust which leads to division and strife: ‘free government is founded in jealousy and not in confidence’ (Jefferson, ‘Kentucky Resolutions’). Or she may follow the Orthodox Tradition and have a constitution based on trust, which brings about wholeness. For trust, Father Pavel Florensky tells us, gives birth to faith (Hosking, ‘Foreward’, in Pyman, Pavel Florensky, p. xvii), the prerequisite to love. Thus the immense and innumerable host of passions invades men’s life. Their life becomes in this way deplorable. For the human beings honor the very cause of the destruction of their existence and pursue themselves, without knowing it, the cause of their corruption. The unity of human nature falls into a thousand pieces, and human beings, like beasts, devour their own nature. In fact, in trying to obtain pleasure and avoid pain, instigated by self-love, man invents multiple and innumerable forms of corrupted passions. If, for example, on account of pleasure, one cultivates self-love, one awakes in oneself . . . pride, vanity, self-conceit, . . . TYRANNY . . . (Thunberg, p. 58, all emphasis added). Adams, John. ‘Letter to the Officers of the First Brigade of the Third Division of the Militia of Massachusetts’. Wikiquote. Posted 8 April 2015. http://en.wikiquote.org/wiki/John_Adams. Accessed 13 April 2015. Calhoon, Robert M. Evangelicals & Conservatives in the Early South, 1740-1861. Columbia, S. Carolina: U. of S. Carolina Press, 1988. Hosking, Geoffrey. ‘Foreward’, in Pyman, Avril. Pavel Florensky: A Quiet Genius, the Tragic and Extraordinary Life of Russia’s Unknown da Vinci. New York, Ny. : Continuum, 2010. Jefferson, Thomas. ‘The Kentucky Resolutions of 1798’. Wikisource. Posted 3 Nov. 2010. http://en.wikisource.org/wiki/Kentucky_Resolutions_of_1798. Accessed 13 April 2015. Thunberg, Lars. Man and the Cosmos: The Vision of St Maximus the Confessor. Crestwood, Ny. : St Vladimir’s Seminary Press, 1985. Man sentenced God to death; by His Resurrection, He sentenced man to immortality. In return for a beating, He gives an embrace; for abuse, a blessing; for death, immortality. Man never showed so much hate for God as when he crucified Him; and God never showed more love for man than when He arose. Man even wanted to reduce God to a mortal, but God by His Resurrection made man immortal. The crucified God is Risen and has killed death. Death is no more. Immortality has surrounded man and all the world. “O Death, where is thy sting? O Hades, where is thy victory?” (I Cor. 15:55). When a man belonging to Christ dies, he simply sets aside his body like clothing, in which he will again be vested on the day of Dread Judgement. Before the Resurrection of the God-Man, death was the second nature of man: life first, death second. But by His Resurrection, the Lord has changed everything: immortality has become the second nature of man, it has become natural for man; and death – unnatural. As before the Resurrection of Christ, it was natural for men to be mortal, so after the Resurrection of Christ, it was natural for men to be immortal.